Seventy years ago today, a single US plane flew a lonely mission to drop a single bomb on a Japanese city. That city was Hiroshima. What fell from a clear blue sky at 8:15 that morning changed the world forever. We recently visited Hiroshima as part of our 10th Anniversary celebratory trip to Japan's Inland Sea area. It's a place that neither of us had visited before, but one we both wanted to see. I wasn't really sure what to expect, but I felt very sure it was something that I should see; maybe it's something that everyone should see. Any discussion of the war in Japan is pretty much taboo - extremely dangerous territory that arouses strong passions on both sides. Even seventy years later, so many aspects of the debate remain unresolved and questions unanswered. But for me, Hiroshima and what happened there is not so much about the rights and wrongs of the war, but about the terrible price paid by ordinary people for the decisions made by others; people whose only "crime" was to have been born in that place at that time. They could have been anyone; they could have been you or I. Their story, then, is our story. The name Hiroshima invokes mental images of death, fire and carnage. But in reality the city was, and is, a beautiful place with an almost European feel to it. Trams ply the streets and the rivers are lined by tranquil parks and little cafes. The only thing out of place in this neat, clean environment is the remains of the City Hall which stand as a stark reminder of the carnage unleashed on that August morning. The Genbaku Dome (genbaku means atomic fission) is instantly recognisable. The atomic weapon exploded 600m directly above the dome, and because the force of the blast was directed directly downwards rather than laterally, the building remained standing - one of only a handful to remain so. Only a small proportion of the uranium in the weapon underwent fission. But the energy released was enough to completely flatten the city to a radius of 2km, and create devastation for many kilometers beyond that. People near to ground zero on that fateful day were simply vaporised where they stood. In the nearby museum, there is a section of stone step from the City Hall building that has the shadow of one victim burnt into it. They just happened to be sitting on the step waiting for the office to open. Their ghostly shadow is all that remains. The museum at Hiroshima leaves visitors in no doubt about the horrors faced by those left horribly burned and injured, nor those that searched in vain amongst the scorched ruins to find loved ones. Many of those killed and horrifically injured on that morning were school children, who had been carrying out civic duties in the city centre or on their way to school. Their stories, and the pitiful relics they left behind like burned school uniforms, shoes and personal effects, are simply heartbreaking to see. Even today, some Western commentators criticise the Japanese for portraying themselves as the victims of war. But seeing the reality of what happened in Hiroshima, it is difficult to think of the Japanese civilian population as anything other than victims; ordinary people who paid a price every bit as horrible as those in Dresden, Coventry or Nanking. Some in the West even go so far to say the Japanese deserved Hiroshima and Nagasaki in atonement for its aggression in Asia. Even the English captions in the museum seem to pander towards this line of thinking, using phrases like "...Japan started the war in the Pacific". The Japanese captions, however, use very different language. And therein lies the source of the heat that still burns seventy years later. This is a massive subject, and maybe one for another time. But it's just worth noting a couple of points. Firstly, the West has largely written-out of history the reasons why Japan felt compelled to go to war. The story actually began a long time before that, in July 1853 with the arrival in Tokyo Bay of the US Navy under Admiral Perry and his fleet of warships, that turned their guns on the city and threatened to destroy it unless Japan opened its borders to the West. What followed was a period of dramatic and violent political upheaval in Japan, and a series of somewhat one-sided treaties that the Japanese were forced at gunpoint to sign. That set in motion a chain of events that culminated in 1941 with the US blockade of oil shipments to Japan which was the immediate precursor to Japan's attack on Pearl Harbour. The second point is that until the US occupation in 1945, Japan was still effectively a feudal economy under military rule, just as it had been under the Tokugawa shogunate. There was no democracy in Japan. Unlike Nazi Germany, where the rise of fascism at least had its roots in democratic process, Japanese people had no power whatsoever to effect change, nor to avoid the consequences of the policies followed by its military government at the time. They were, then, in a very real sense "victims" of both their own ruling class AND US foreign policy at the time. The Japanese are acutely aware of both their own sense of victimhood, and the fact that these feelings are not understood in the West. The museum at Hiroshima makes much of the children killed and maimed in the atomic bombing, but almost completely fails to mention the fact that Hiroshima was a garrison city and one of the main embarkation points for the Imperial Army, essential in supporting Japan's military campaigns in Asia. But for all that, the Japanese today are genuinely passionate and resolute in their commitment to peace. One phrase used on one of the memorials in the city cautions against the "misguided policies of governments". An admonishment that could apply equally well to Blair and Bush's criminal war in Iraq as it could Japanese imperial expansion in Asia. My feelings are that Hiroshima truly stands today as a monument to peace. More specifically, a reminder to our rulers that it is the ordinary people that pay the price for their decisions in fire and pain and blood; a reminder that people today in Baghdad, Kabul, New York, London, Paris and Tunisia are STILL paying the price for their failures. In that regard, both Westerners and Japanese people share absolutely the same mind. Today is a day when everyone should say a silent prayer for those that died in Hiroshima. That prayer should ask that the heat still generated by the events of seventy years ago be nurtured not as the fire of war but as a flame for peace and reconciliation. In this way, those deaths will not have been in vain. What's so great about Japan? When I travel back to Europe and I meet with someone who finds out that I live in Japan, the inevitable first question is along the lines of "What do you like about Japan?" It's a question I have fielded hundreds of times, and to be honest I tend now to try and just skip over it as quickly as possible. It's not that I don't want to answer, or that I find it tedious to trot out the same basic response each time. It's more to do with the fact that I find it such a difficult question to answer honestly. What's so great about Japan? Everyone has their own ideas, of course. For me, it has always been a problem to articulate my particular viewpoint. I have loved the country since the very first moment my foot touched Japanese soil. I have visited and worked in many countries, and I've enjoyed them all. But I have never felt such an instant connection with any of them in the way I did with Japan. I have never been able to adequately explain why. Until now. I think the most honest answer is: I like myself here. There are places—Calcutta is one—where you can come to loathe yourself. I never knew I would be ready to kick children from my path, to strike out at cripples, to compose a face apparently contemptuous at the sight of misery so great it seemed almost theatrical. And all because of sheer terror. I, along with most of my richer Western brothers, had believed that such qualities as disinterested politeness, trust, friendship, even love are necessities. It had never occurred to me that they are luxuries until India showed me that this is so. Such attributes—the pride of Western man—are but accoutrements, like well-cut clothes. They are removable. One can go naked and miserable. For me, that's it in a nutshell. I like myself here. 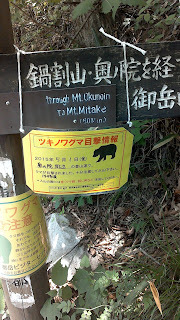 In Japan, you can be kind, polite and gentle, and nobody mistakes this for a weakness to be exploited. In fact, quite the opposite - to be strong, yet quiet and benevolent are considered the ultimate manly attributes. As the great Dan Inosanto (shameless namedropping: Malc, Lewis and myself had the honour of training with Guru Dan many years ago) is fond of saying "Don't mistake kindness for weakness". The inference is that the truly strong man has the capacity to be kind and gentle, not because he is weak but precisely because he is strong. But in the UK, wherever you go, there is always some entity that tries to challenge this and impose its "Might is right" view of the world on others. Either personally through loutish anti-social behaviour, or indirectly through faceless unaccountable corporations or useless government bodies. I got so tired of having to fight endlessly with these people on a daily basis. I got tired of having to stand my ground, react forcefully to a threat or waste time and energy fighting with idiots. All of that stopped the moment I arrived here. Japan, then—to answer this perennial question—allows me to like myself because it agrees with me and I with it. Moreover, it allows me to keep my freedom. It makes very few demands on me—I am considered too much the outsider for that, a distinction I owe to the color of my skin, eyes, and hair—and, consequently, I become free. I become a one-member society, consistent only to myself and forever different from those who surround me. Our basic agreement permits an amount of approval, some of it mutual; our basic differences allow me to apprehend finally that the only true responsibility a man has is toward himself. In Japan, not only am I free of the jobsworths, louts and gobshites, I am free to be exactly who I want to be; to hold my own standards and to set new ones of my choosing based on the things I have learned here. In other words, Truly free. One of the great things about the internet is the way that it has democratised writing. Once upon a time, getting your work into print was the hard-won privilege of the favoured few - at least, those who didn't want to stump up the cost of vanity publishing. Now we have Amazon, and anyone with a computer and a story to tell can have a go. Predictably, this has generated an awful lot of tosh. I spend a lot of time looking for authors worth reading on my Kindle, and a lot of the time it's like searching for a Wispa bar in a sea of turds. Just occasionally I stumble across someone really worth the effort, like the excellent Carrot Quinn (see my links). But more often than not I find myself getting to the end of a slim volume and thinking "What the bloody hell was the point of that"? One such example was the book on "Over 50's Fitness" I previewed last night. Among the earth-shattering insights offered by the author was the fact that you slow down as you get older and you probably shouldn't try to go from coach potato to marathon runner in one month. But the one thing that really tickled me was the author's authoritative run-down on medical conditions likely to afflict the over 50's. Number 1 was stiff joints. Well, OK we all feel a bit stiff in the mornings. Number 2 was hair loss. Now, I had never considered hair loss due to natural ageing to be a medical condition. But our font-of-all-knowledge solemnly assures us that the psychological impact of male hair loss can be catastrophic. Really? Let's face it, most of us blokes are going to go a bit threadbare up top as we get older. For the vast majority of us, it's going to occur in our thirties, and for the vast majority of us, we're over lamenting the loss of our youthful mane in a very short space of time. Just have it cut short and get on with life. There are always going to be some that just can't handle it, finding solace in the syrup or hair transplant or comb-over for the stingy ones. Incidentally, the comb-over is known as "the bar code" in Japan - which always makes me laugh. I feel sorry for anyone that struggles to come to terms with approaching slap-headedness. But at the same time, I can't help thinking that their grasp on their masculinity must be a bit flimsy at best if they allow it to be defined by their lack of spam. It's a well-known fact that male pattern baldness is in fact dictated by the amount of testosterone flowing through your veins. Therefore baldness surely should be celebrated as a badge of honour rather than covered up and cited as a cause of psychological trauma. Mr "Fit Fifty" is talking out of his arse. And anyway, as any bloke over fifty knows, your hair doesn't disappear - it merely migrates from the sunlight uplands of your bonce to the shaded groves of nostril and ear lobe! There is nothing worse than being stuck indoors when the sun is shining. Now the weather is really warming up, your humble scribe is itching to pull on his boots and head for the hills. But - alas - there just seems to have been one thing after another that has delayed my departure. 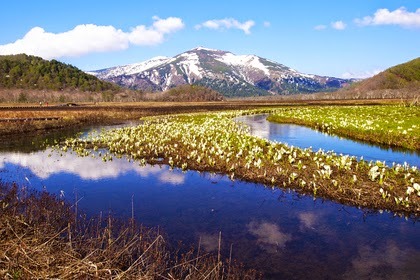 I had originally planned to hike the Oze marsh region in Gunma ken this week to coincide with the blooming of the unfortunately named Skunk Cabbages (whoever thought of that name was a clearly a bit of a charmless berk). It's a trip I've been looking forward to for quite a few months - a 3 day/2 night hike across fairly flat terrain but with a whacking great 2346m peak in the middle of it. The idea was to explore the area in preparation for a return with Big M in July when the lilies are out in the marshes. Minus the mountain, of course, as my Mrs only operates on the flat! I will shortly be visiting the UK, but before being allowed to leave the country I was under strict orders to complete installation of Stage 2 of The Great Kitchen of Tokyo. This was quite a major project, involving the removal of walls, the installation of other walls, plumbing, electrics and major redesign of kitchen units. I achieved this milestone last weekend, and although I have to admit I thoroughly enjoyed it, it has put a massive spanner in my plans to get away. I guess in common with others my age, there seems to be increasingly less time to do stuff. I really worry about the speed that time seems to whip past now without me having done very much at all. After some careful consideration, I think I have a theory to explain why this is. It's common knowledge that things start to speed up once they start to go downhill. At 53, it's fairly safe to assume that I am on a downhill slope and accelerating fast. And, as Einstein taught us with his Special Theory of Relativity, time appears to move at a different rate for different observers depending on how they are moving. So for me, accelerating steadily, the world appears to be speeding up; for others, I appear to be slowing down dramatically, which is pretty much the observation of my daughter! I am sure Albert was onto to something here - hence the reference to "relatives". Spring is now well on its way in Tokyo. This morning I extended my Sunday morning run out to 15km along the Zenpukuji and Kanda rivers, sweeping round in a wide loop to take in a few of the local parks along the way. The local authority has done a splendid job of creating a footpath that follows the course of the two rivers, with cherry lining the route for virtually the whole length. Japan is of course famous for its cherry blossoms that explode suddenly in the spring and transform even the most austere urban landscapes into incredible spectacles of colour. Cherry blossom, known as sakura in Japanese, is a cultural icon; the blossoms appear suddenly and utterly transform the landscape, creating huge vistas of delicately coloured blossoms that make it look as if the trees were made of clouds. The drabness of winter is cast aside in a matter of hours as life once again bursts forth, painting the landscape with splashes of colour the herald the warmer days to come. People's spirits are transformed too as they gather underneath the blossoms to marvel at the sight, to drink and eat and make merry to celebrate he return of life. And just as quickly, the blossoms are gone. Sakura time is a time great significance to Japanese people because the blossoms not only signify the magnificence of life, but also its brevity. The blossoms are incredibly beautiful but fragile, and the slightest wind plucks them from the trees and sends them floating gently to earth. To the samurai, the beauty and fragility of the sakura came to represent the impermanence of life itself. Us Westerners, raised on the Christian idea of an everlasting spirit, have a hard time dealing with the idea of impermanence but not so the Japanese, who view everything as transient. After finishing my run and the compulsory bacon buttie afterwards, me and the mrs made plans to head over to Tachikawa for a bit of shopping. We boarded the train at Mitaka, and then sat there for 30 minutes. All the trains on teh Chuo line had stopped because of an "accident" at one of the stations further along. An "accident" is a euphemism for a suicide. The Chuo line is a favorite suicide spot due to the speed and the frequency of trains that ply up and down between the city and the outlying districts. So, on this wonderful spring day in Tokyo, someone, somewhere today recieved the hammer blow news that a loved one had chosen to end their life under the wheels of a Chuo line train. Someone woke up this morning, and took the decision that this was their last day on Earth. This time of year is about the return of life; yet this morning it was about the end of life for one unfortunate soul. This morning one precious sakura blossom lost its tenuous grasp on the branch of life and was scattered to the ground. On such a lovely Spring morning, the tragedy of it was particularly poigniant. Takao and the surroundings are a great warm-up for longer hikes. For this first outing I decided to hike up the Inariyama course and then kind of improvise when I got to the too. 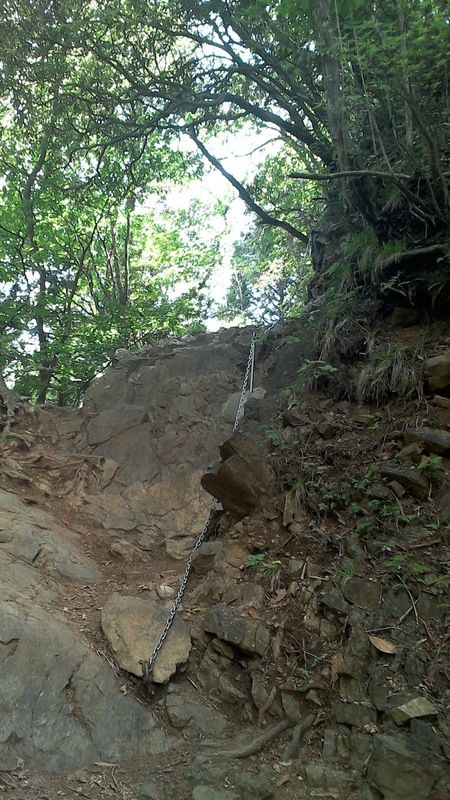 I chose this route up because it features quite a lot of steep climbs and stairs, thus providing a good workout for the pins. In contrast to last year's inaugural ascent, the weather was set fine. 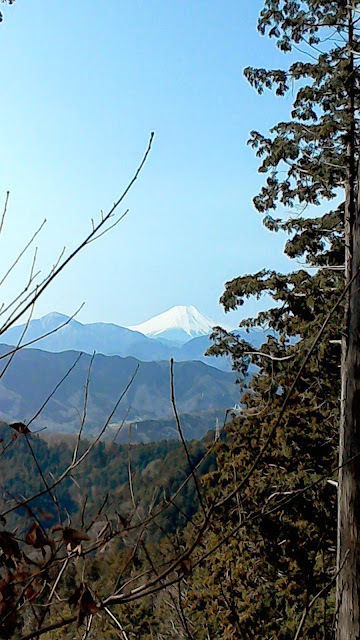 As it was still quite early when I hit the summit, I was rewarded with a fantastic view of Fuji san.